I've been so busy lately I've fallen behind in my blogging. I wanted to write about Kariya Park, a nice little zen garden I discovered when walking along Burhamthorpe near Square One in Mississauga. I was strolling along, enjoying the sunshine, when I stumbled upon a little oasis tucked away amidst all the concrete and office buildings. 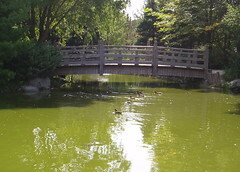 It's called Kariya Park and it was opened in 1992 to commemorate Mississauga's twin city relationship with Kariya City, Japan. 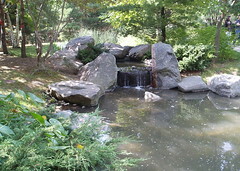 It's a tiny park but awfully peaceful and full of soothing and eye pleasing waterfalls, ponds and streams. As you'll see from this photoset, it also has a great deal more. It's been around for fifteen years but it's new to me. What a find! Nice park, lately me and the rest of the team have been checking some of the other parks in Toronto. Is that near a convention centre of some sort? I think that's where I went to have some pics taken after my graduation ceremony from Sheridan. It's off Burnhamthorpe near Hurontario. I think the street is actually called Kariya Drive. Maybe your ceremony was at the Living Arts Centre? I was working near there and stumbled upon it as well and it soon often became my escape from work, the place to go during my hour lunch. It is such an anomaly in Mississauga, it's the only thing I liked there. Well, that and 50 west. lol.